When I first started this blog, I said there was no secret to happiness. Rather, happiness was a state of being and to be happy, you had to do happy acts and seek joy in every day moments. Well, after a year of #HappyActs, I’ll let you in on a little secret. I lied. I believe there is a secret to happiness, and I was lucky enough to stumble upon this pearl of wisdom a few years ago while reading a bathroom book in a bookstore in Chatham, Massachussetts. The premise of the book was simple: in order to be happy, you need to have low expectations. I remember laughing when I first read that because it goes against everything we are taught, which is to be ambitious, set goals, and have high expectations. But the stark truth and simplicity of this philosophy slowly started to sink in and I have tried to live by this adage ever since. Have you ever wondered why on sites like TripAdvisor, you read a review of someone who stayed at the same hotel or bed and breakfast as you did, and you thought the place was just fine, but they panned it? It all comes down to expectations. 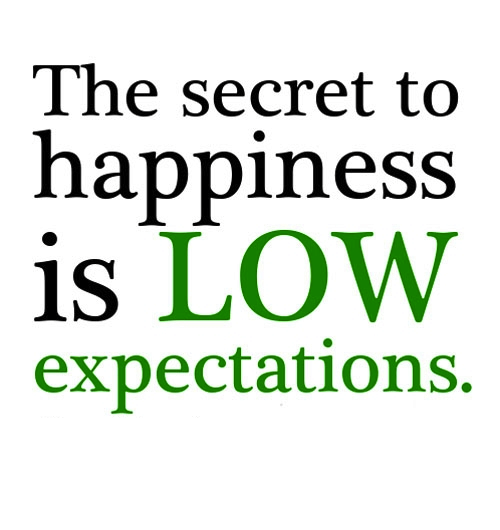 If you have low expectations, you will always be happy with your lot in life. This doesn’t mean you shouldn’t set goals and work towards them. On the contrary, anyone will tell you having goals and dreams is critical to having a purpose and feeling fulfilled in life. Let’s take the example of an Olympic athlete to illustrate this point. Olympic athletes set lofty goals: to be the best in their sport, medal and to be standing on that podium. They work extremely hard to get there, making huge sacrifices to see this dream come true. But when you hear them interviewed, their expectations can be very different—they may expect to finish in the top 10, or beat their best time. And when they don’t get the gold, they are happy with their achievement. This week’s #HappyAct is to dream big, work hard towards your dreams, but make a conscious effort to have low expectations for yourself. Note I said yourself, not others. Continue to have high expectations of others and they will rise to the occasion. What do you think is the key to happiness (other than doing one happy act a week!)? Leave a comment. Interested in hearing more? Watch this TedTalk with Barry Schwartz, “The Paradox of Choice”. Hey Laurie, I laughed out loud as well when I first read this. It does, at first, conflict with everything we are taught. I think the message is that we can be far too hard on ourselves. In the course of a normal day, much happens outside of our control, despite our best efforts. We can’t become discouraged when everything doesn’t go our way. You are so right, Ray! That’s why I have a canoe and not a yacht. That’s also why I had to use a dictionary to look up the spelling for yacht, I was sure there is a “u” in there someplace.